You can view and add information about your photos. For example, you can see the date and time a photo was taken, information about the camera that took the photo, and badges that indicate the state of the photo. You can assign titles and captions to photos, add or change the location of photos, and change the date and time information for them. You can select multiple photos in a moment and add or change information about them all at once. Tip: You can add text captions, dates, arrows, and other shapes directly to a photo using the Markup tools. See Use Markup to add comments or draw on a photo. You use the Info window to view or change information about photos. In the Photos app on your Mac, double-click a photo to view it, then click the Info button in the toolbar, or press Command-I. Title: Enter a name in the Title field. Tip: To quickly add titles to photos right in the main Photos window, choose View > Metadata > Titles, click the field that appears under a photo when you hold the pointer over it, then type a name. Description: Enter a caption in the Description field. Favorite: Click the Favorite button to mark the photo as a favorite. Click the button again to unmark it. Keywords: Enter keywords in the Keywords field. As you type, Photos suggests keywords that you’ve used before. Press Enter when you’ve finished a keyword. To remove a keyword, select it and press Delete. People: Click the Add button and type a name to identify a person. To identify multiple people in a photo, click the Add button and drag the face identifier over each person you want to identify. You can display the title you assign to photos, metadata (information about each photo, such as its file type), and badges that identify whether the photo has been edited, had keywords added, and more. In the Photos app on your Mac, choose View > Metadata > [metadata name]. Photo has had keywords applied. Photo’s location has been identified on a map. Photo has been marked as a favorite. Item is a video, slo-mo, or time-lapse clip. Original photo is stored in another location (not in the Photos library on your Mac). Original photo was taken as a High Dynamic Range (HDR) photo that combines three photos taken at different exposures. Item is a Live Photo. Item is a Live Photo set to bounce. Item is a Live Photo set to loop. Item is a portrait photo. You can change the date and time associated with a photo—for example, if you travel to another time zone, and your camera assigns dates and times that are correct for your home, but not the place you visited. In the Photos app on your Mac, select the photos you want to change. Choose Image > Adjust Date and Time. Enter the date and time you want in the Adjusted field. Click a time zone on the map and choose the closest city, if necessary. 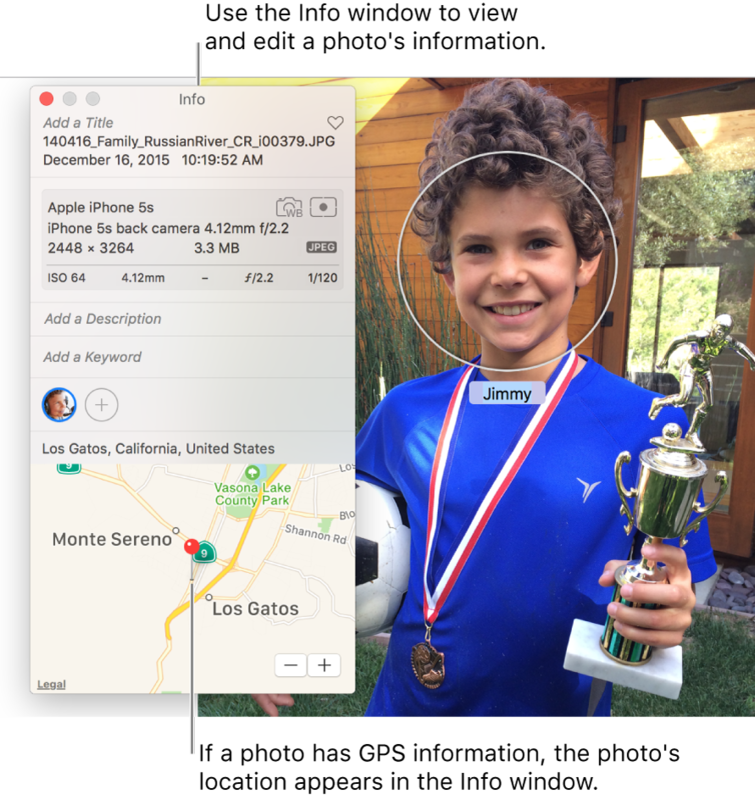 You can remove a photo’s location information or restore its original location information. Choose Image > Location, then choose Remove Location or Revert to Original Location. If you manually assigned location information to a photo that did not have it, Revert to Original Location removes the location information you assigned.